This antibody specifically binds to Malondialdehyde LDL and other Malondialdehyde modified proteins. 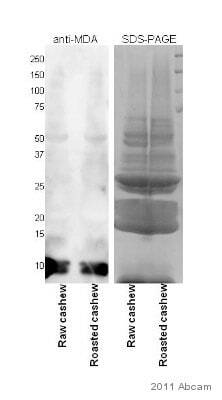 This antibody was purified by MDA modified protein Sepharose affinity column. Our Abpromise guarantee covers the use of ab27642 in the following tested applications. Conjugation Use at an assay dependent dilution. Malondialdehyde (MDA) is a natural product formed in all mammalian cells as a product of lipid peroxidation. MDA is a highly reactive three carbon dialdehyde produced as a byproduct of polyunsaturated fatty acid peroxidation and arachidonic acid metabolism. MDA readily combines with several functional groups on molecules including proteins, lipoproteins, and DNA. It reacts with DNA to form adducts to deoxyguanosine and deoxyadenosine. The major adduct to DNA is a pyrimidopurinone called M1G which appears to be a major endogenous DNA adduct in human beings that may contribute significantly to cancer linked to lifestyle and dietary factors. MDA modified proteins may show altered physico chemical behavior and antigenicity. MDA is toxic and has been implicated in aging mutagenesis, carcinogenesis, diabetic nephropathy and radiation damage. Increased expression of MDA has been reported in the brains of Alzheimer's patients. Antibodies to MDA will help to visualize the MDA adducts. Publishing research using ab27642? Please let us know so that we can cite the reference in this datasheet. Thank you for your inquiry. As this is a small molecule, there is no species reactivity associated with it. We expect the antibody to recognize Malondialdehyde regardless of the source. I hope this information is helpful. Please do not hesitate to contact us if you have any additional questions. 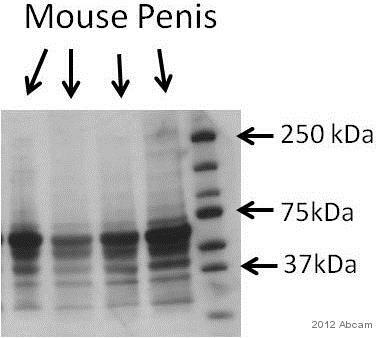 I just used your antibody (ab27642) and have a question about analyzing the bands. Is there an exact molecular weight band to analyze? I saw the abreview from the person who used it in cashews and they said their band was 10-12 kDa. Since this antibody detects MDA modified proteins and there should be lots of them, should I be analyzing the whole lane of my Western and including bands from all molecular weights (10-above 250kDa) in my analysis? I would suggest analyzing the entire lane. The MDA-modifications and their extent of it will vary from sample to sample as well as from species to species. It might very well be that in cashews there is only one major protein that has this modification. But in samples from other species the MDA modificationscan be present for a wider range of proteins.